There’s nothing better to launch yourselves toward the Grand National that to have a spectacular show at the New York Regional in September. It’s simply a grand way to put that last bit of confidence in your team and work out any last wrinkles in your performance before heading west. 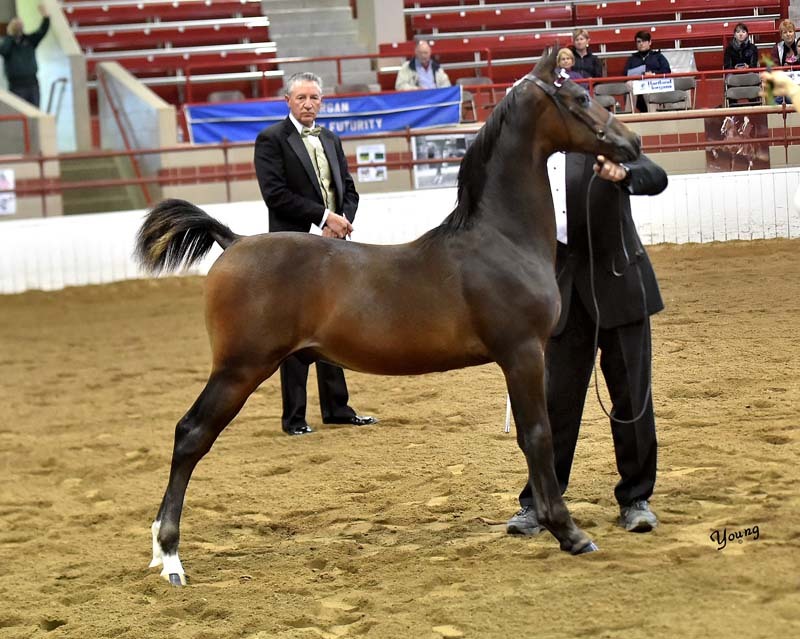 Highlighting our incredible NY Regional was Ledyard Oakley (Man In Motion x Wild Imaginings), William Haines’ stunning weanling who topped the NY SSA Sweepstakes Weanling Championship, bringing home a hefty check and a load of roses and silver for her very proud breeder/owner. Lynn really enjoys leading the babies and this filly is so very special. Her win marked a third consecutive win for Lynn in this class. 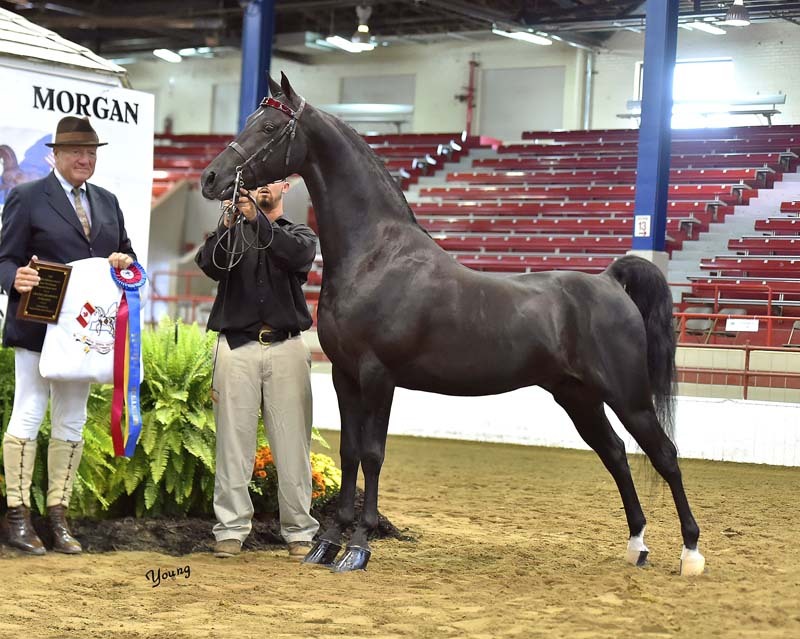 Lynn also lead his own exceptional weanling, Unique (Roberto Cavalli x Honeytree’s Simply Unique) to third, as well as Titan (Town Assets x MEM Uptown Girl) to sixth place in a large, competitive group of beautiful weanlings. Earning their way through the NY Morgan Futurity for William Haines’ Ledyard Farm were three wonderful young horses, Ledyard Maximilian (Town Assets x Mendon Belle Amie) as the winner of the Futurity Two Year Old Colts and ultimately the NY Futurity Two Year Old Championship with Lynn on the lead. 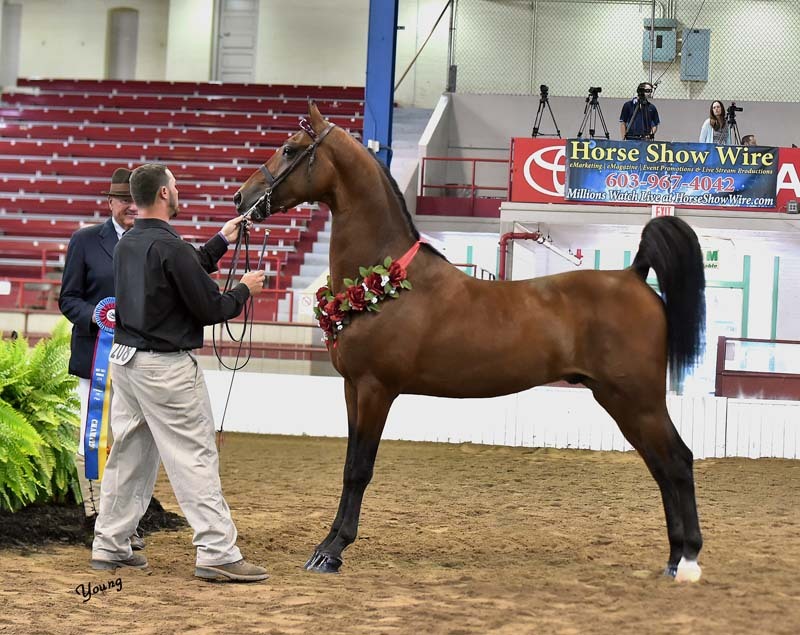 His beautiful stablemate Ledyard’s Immortal Asset (Town Assets x CBMF Immortal Belle) was a star all week, kicking it off as the winner of the Yearling Fillies, then the NY Futurity Yearling Fillies and capping it off as the NY Futurity Yearling Champion. 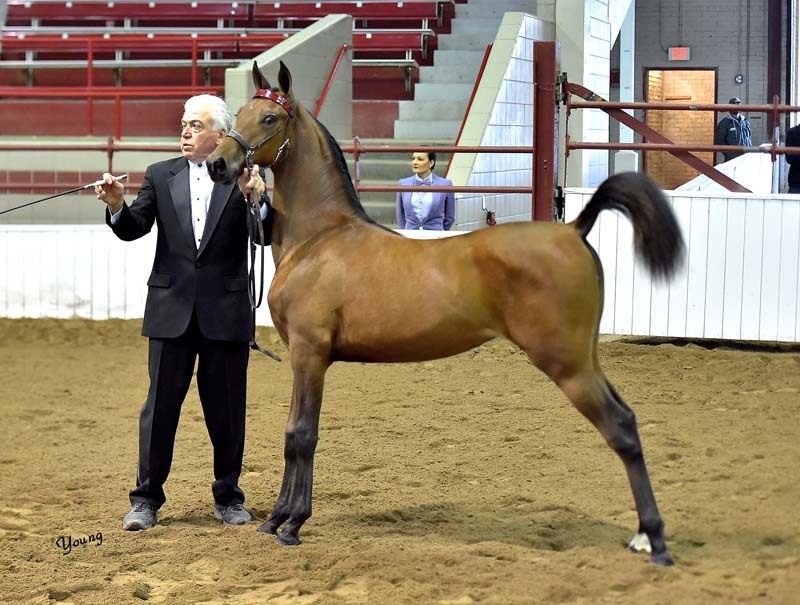 Ledyard’s Barolo (AFF Leroy Brown x Wintop’s Princes Vanity) was also victorious as the winner of the Yearling Colt class, Reserve Junior Champion Stallion and then bringing home the prize money as the NY Futurity Yearling Colt Reserve Champion to Ledyard’s Immortal Asset. 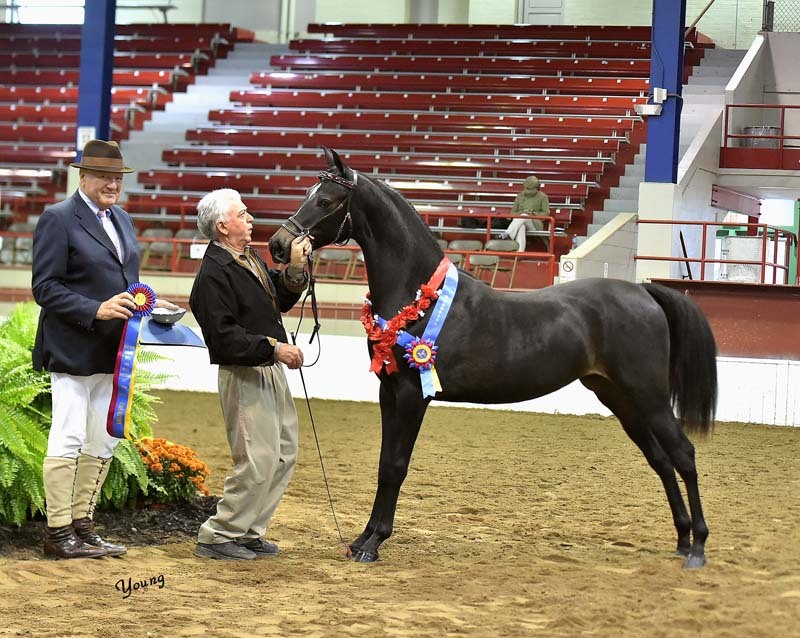 Our other in hand winners in Syracuse included ADC Man On Fire (Man In Motion x Alphastar Exotic Assets), shown by Christopher Bernard and Lynn to Grand Champion Gelding, Junior Champion Gelding, a win in Two Year Old Geldings as well as Reserve Champion NY Futurity Two Year Old and Reserve in the NY Futurity Two Year Old Colts. 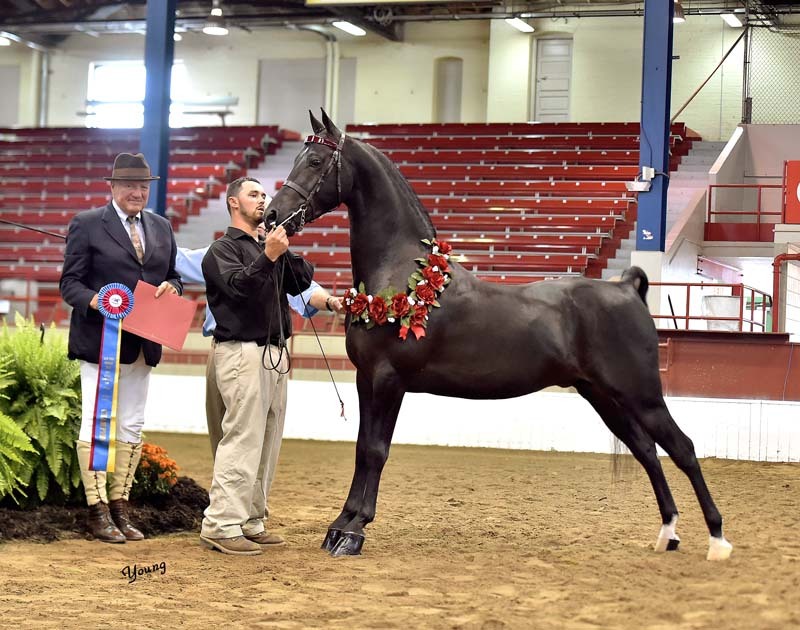 World Champion Ledyard’s Lucky Lucas (Astronomicallee x Graywood’s Epona) continued his winning ways as the Grand Champion Stallion, Senior Champion Stallion, and was winner of the Three Year Old Stallions. 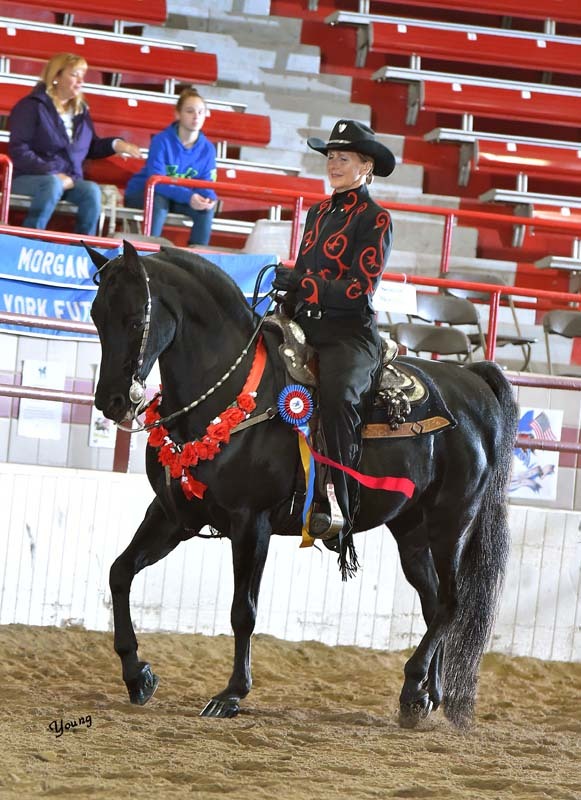 Proving he’s not just beautiful, but talented as well, this versatile young stallion was also ridden to the NY Futurity Three Year Old Park Saddle Championship by Kathleen. 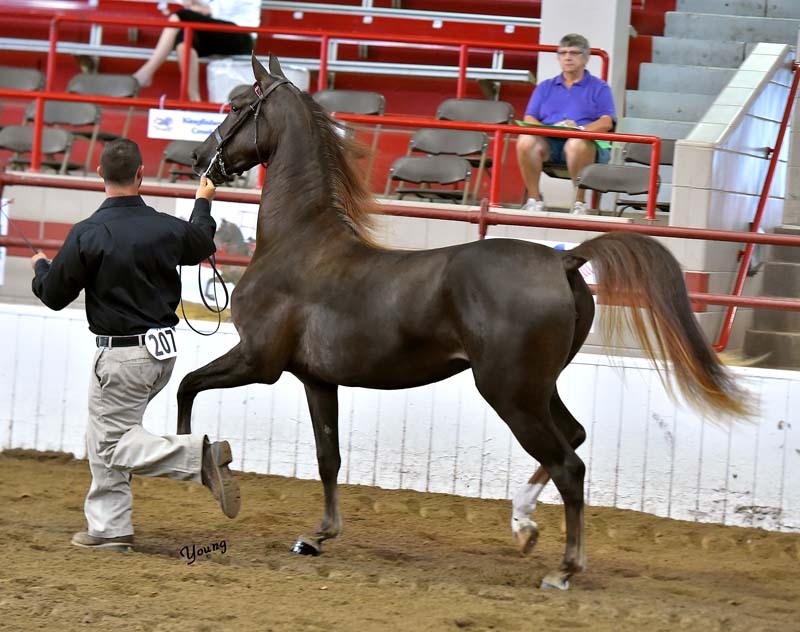 Winning the Park Saddle Junior Horse was LPS Endless Love (Man In Motion x Illicit Love), another outstanding entry of Ledyard Farms. 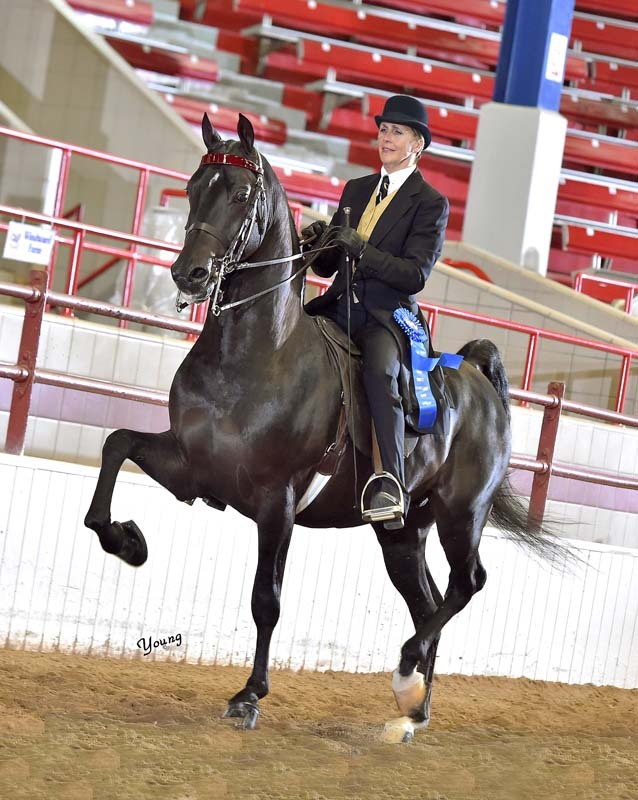 Lynn piloted this World Champion to her win and will be leading and riding her in OKC next month. 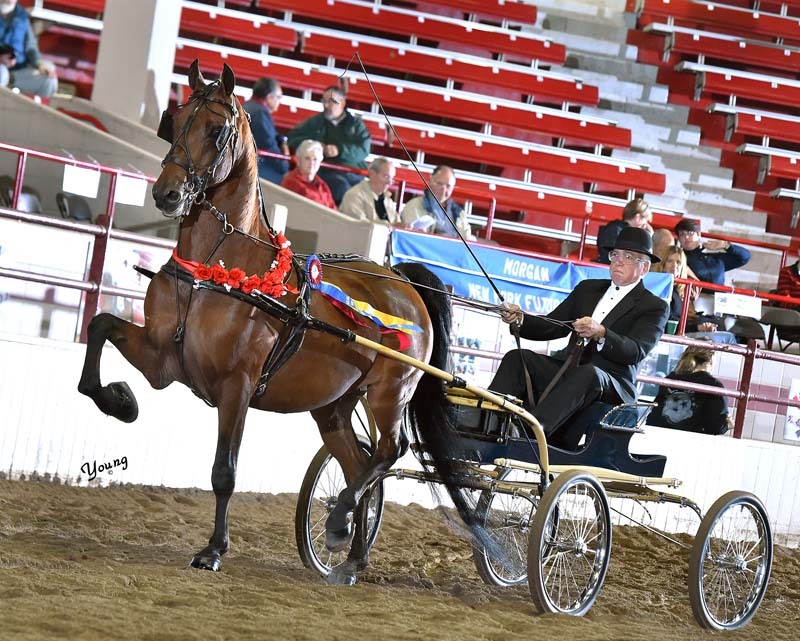 Robert Severino and EKL May Acclaim enjoyed two winning drives in Pleasure Driving Amateur and Pleasure Driving Limit Horse. 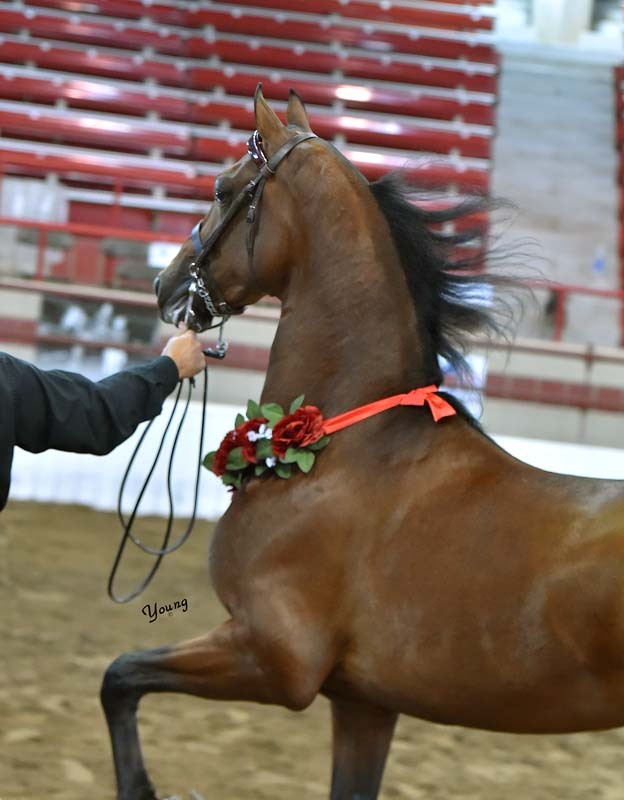 This team has improved with every show and we are thrilled with their progress. 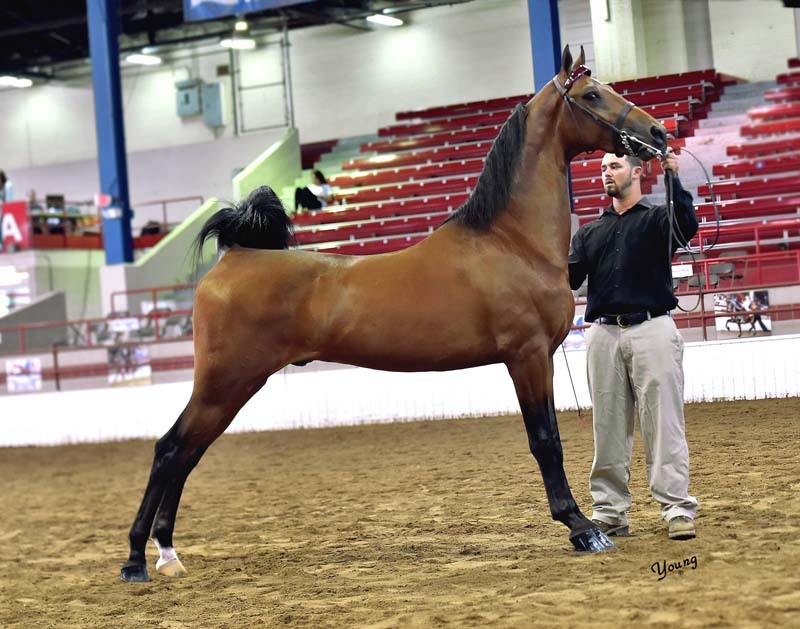 May Acclaim is available for purchase, please visit our Sales Page to find out more about this nice young show horse. 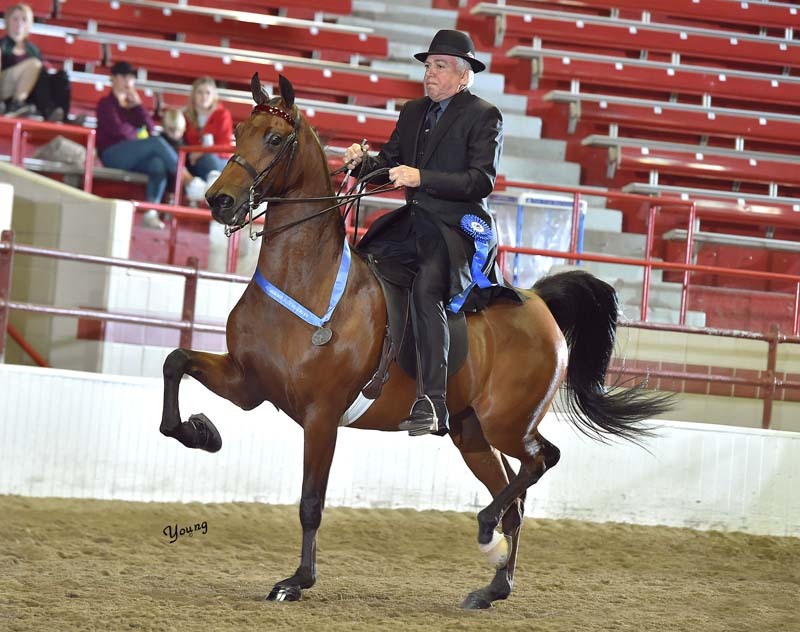 Also enjoying a blue ribbon drive was Cathy Miller and EKL Utopia (Man In Motion x MJL Electra), winners of the Classic Pleasure Driving Ladies, reserve in the Open and finishing up with a strong third in the championship. 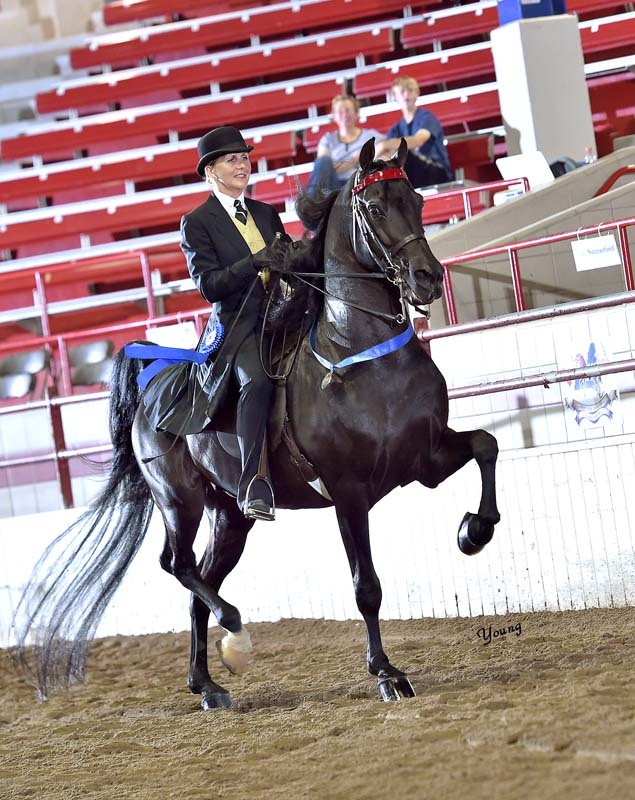 Erdenheim Farm continues to enjoy a winning season with their stylish stallion Moe Tall (Man In Motion x Illustra Aurora), who made a clean sweep of the Open Park Harness division with Lynn on the lines. 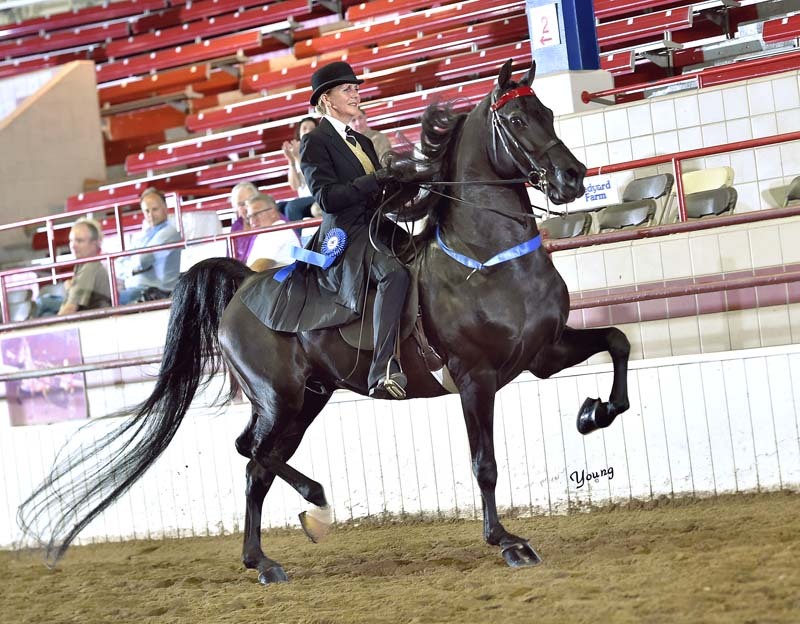 HL My My (HyLee The Rage x Hip Heath Teardrop) and Kathleen have had a winning partnership for more than a decade for Holly Seavitt, and this dark and lovely mare enjoyed a win in the Western Pleasure Mares here before jogging down victory lane in the Ladies Western Pleasure Championship. 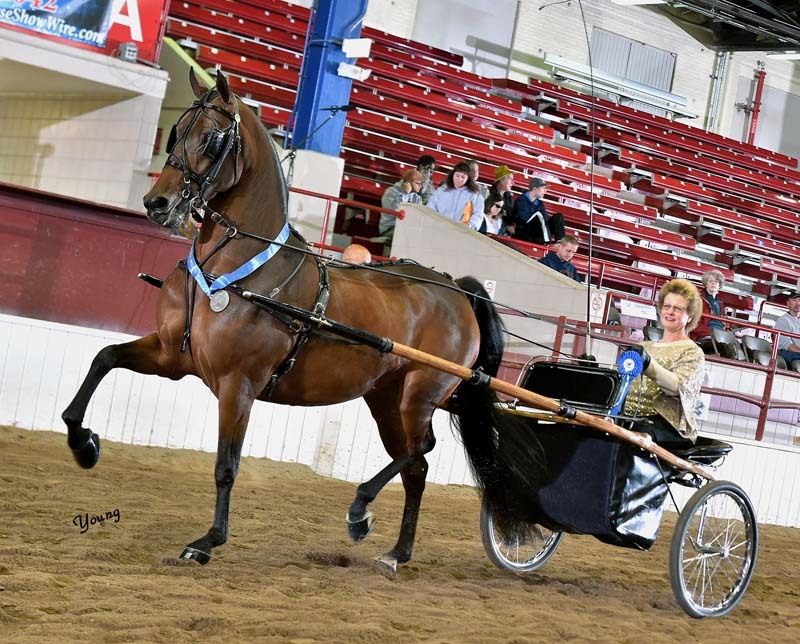 The outstanding young harness mare Portfolio (Town Assets x CHMH Grand Gift of Honey) continues to chalk up points for her sire with every appearance. 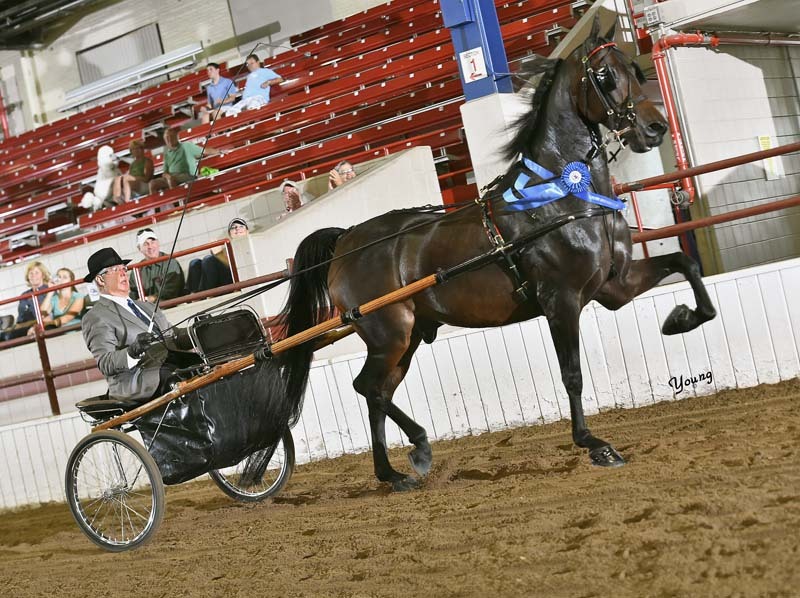 Lynn drove her to reserve in Three Year Old Pleasure Driving. 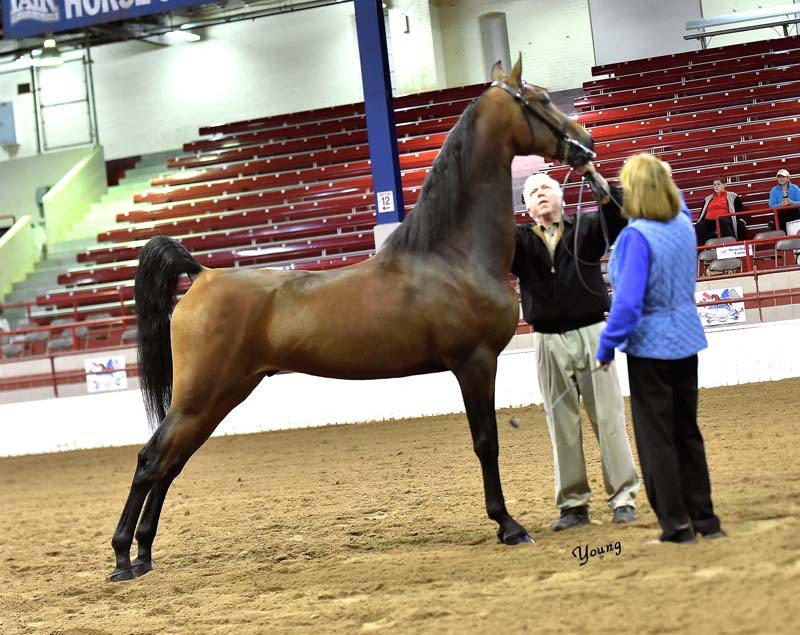 Lynn had his turn and now Kathleen is enjoying showing the handsome black stallion Man In Black (Town Assets x Town Sweetheart) for William Haines’ Ledyard Farm in the English Pleasure Stallions & Geldings, where their effort resulted in a blue at Syracuse. 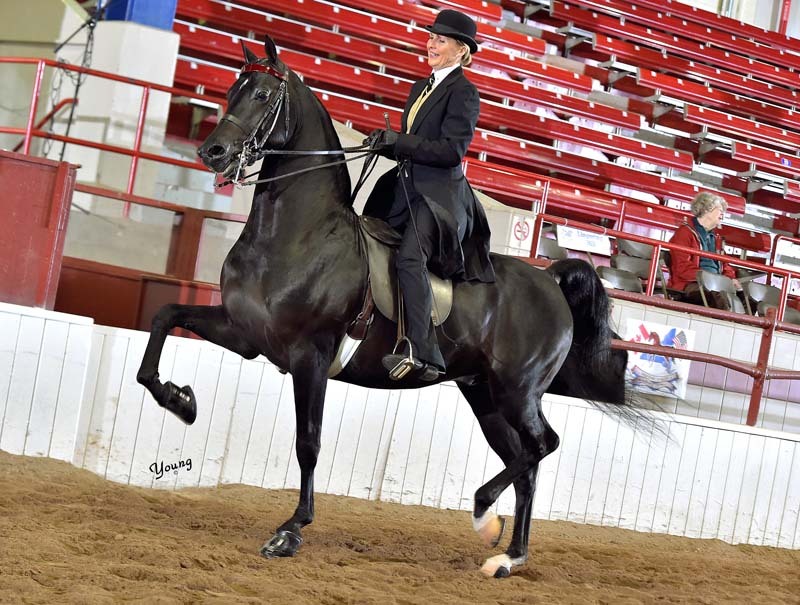 Kathy was also in the saddle for a Reserve Championship ride in the NYSMHS SSA Park/English/Classic Sweepstakes with SSL Ultimate Design (Bellerophon x Honeytree No Illusion), who was the 2010 NY Sweepstakes Weanling Champion earlier in her career. 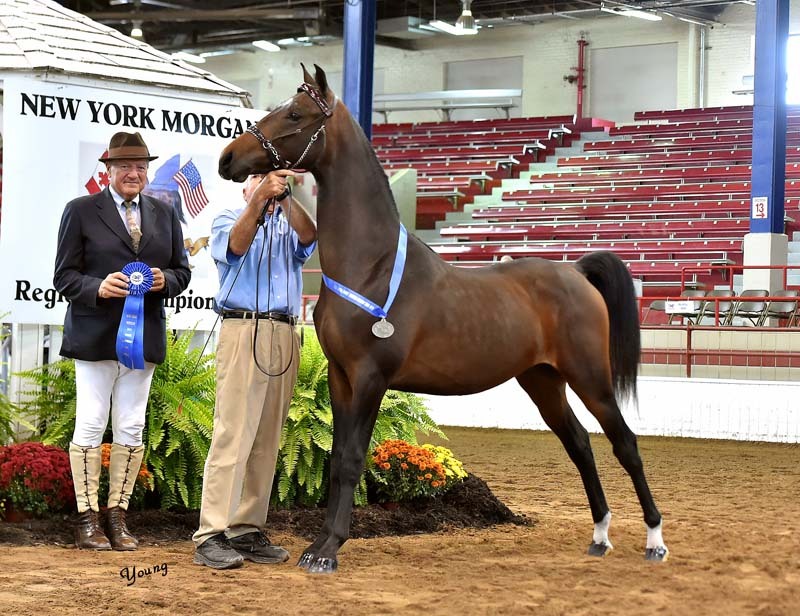 She brought home the bacon again with Armada Captain Morgan (Treble’s Tanqueray GCH x MEM Playmate) as the NYSMHS SSA Hunter/Western Pleasure Sweepstakes Champion. LPS Beaudacious (Bellerophon x Illicit Love) and Kathleen enjoyed one ride, but it was a good one as they won the Western Pleasure Novice horse for Cindy Fawcett. It’s been great having Lauren Cojocar back in the saddle this season, and Lauren enjoyed two nice rides on her beautiful mare AMHF Illusion of Grandeur (HVK Bell Flaire x Delusions of Grandeur). 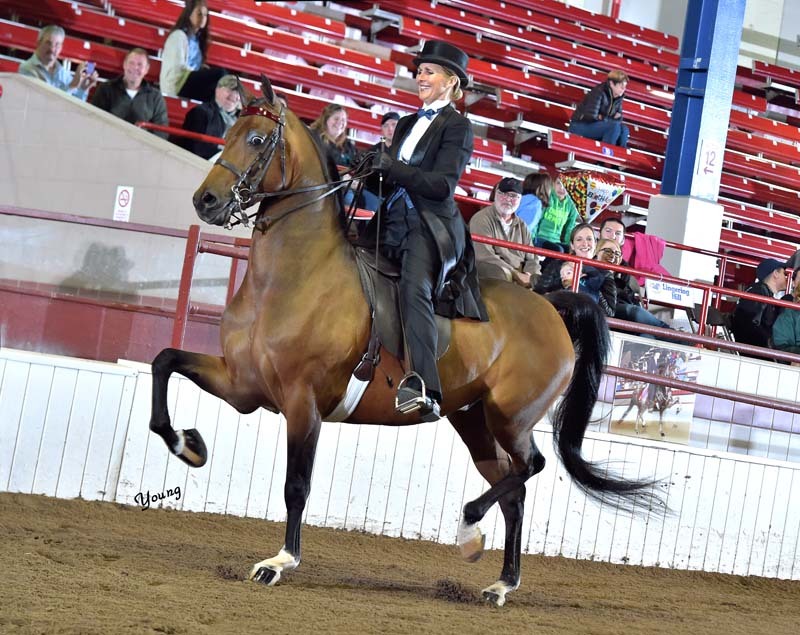 She was reserve in both the English Pleasure Amateur and Amateur Ladies qualifiers and did not show back. 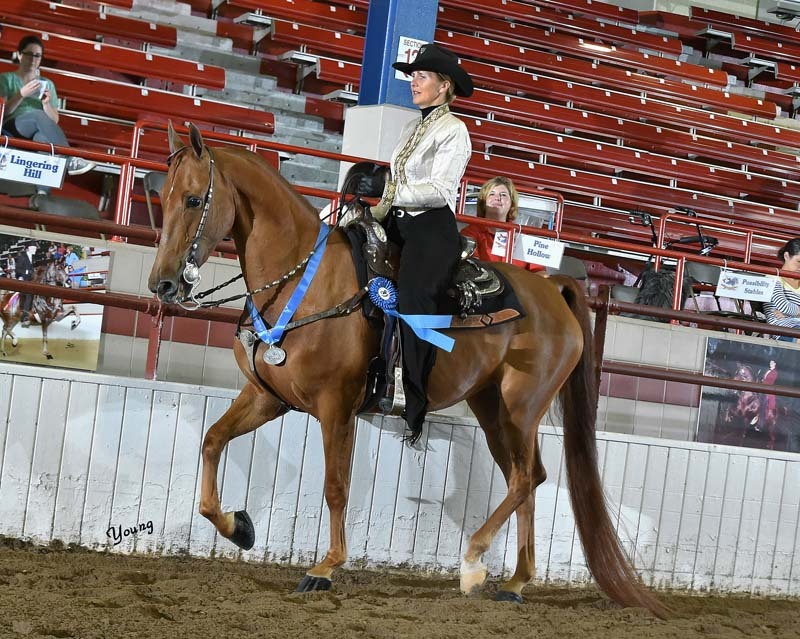 Our thanks to the show management and their hard working crew for putting on a great horse show, it was a show to remember for all of us and we can’t wait to get to OKC! Tuesday, September 16th, 2014 at 7:53 pm • News • RSS 2.0 feed Both comments and pings are currently closed.